Having long and healthy hair is a dream for everyone but a number of people face various problems related to hair. Hair loss, thinning of hair, complete baldness, patchy bald spots, and slow hair growth are some examples of the problems that cause weak and brittle hair or baldness of the scalp. 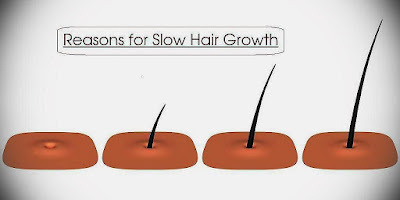 Slow hair growth can be a sign of a serious hair disease or it can be a separate health issue. Healthy and strong hair grows faster since they are getting enough nourishment from the body. On the other hand, if the rate of hair growth is not faster, you may have some reasons responsible for this problem. Slow hair growth may occur any time in the life and both men and women may be the victims of this health issue. Some of the reasons are easily detectable but some of them need a medical diagnosis and treatment. However, the rate of hair growth is not the same for all the people but extremely slow hair growth should be a warning sign for the patient. Slow hair growth shows that maybe your hair is deprived of adequate nourishment. Hair, like other parts of the body, has nutritional needs and you must fulfill them by having a nutrient-rich diet. Thus, if you are facing slow hair growth, treat this condition like an alarming sign and improve your diet. Drinking and smoking are injurious for general health and this is not a hidden fact. But probably you do not know that these habits may affect the rate of hair growth as well. Drinking and smoking affect the blood circulation in the scalp resulting in a slow hair growth. If you want to perform well in today’s society, you have to face stressful situations. Thus, you have to deal with a high level of stress that is a prime cause of slow hair growth. In such situations, hair patients need the help of psychological professionals to reduce the level of stress. If we ask, you may tell about multiple hair products available in the market but it is not sure you know about the best products that are suitable for your hair. We mean to say that it is necessary the products available in the market are good for hair. Maybe, chemicals present in the products are harmful to the hair growth. Thus, always be careful about the products you use for your hair. 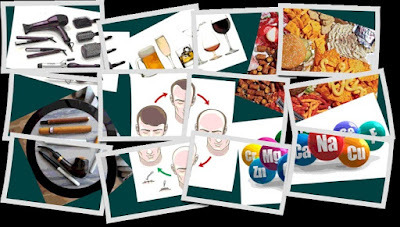 If your hair loss problem is genetic, you have limited option to cure the health issue. Genetic hair loss or pattern baldness may occur at any age and the slow hair growth and thinning of hair are the first signs you may observe. Only a certified doctor can advise you in the case of severe hair loss. Most of the time we talk about the health of hair and in this process, we ignore talking about the scalp. The healthy and clean scalp is necessary for the nourishment of the hair. oil or other products may clog the pores of the scalp to make it unhealthy. Having different hairstyles is a fashion but different hairstyles may result in breakage of the hair, split ends, dry scalp, and other hair problems. Ultimately, all these problems may end in the improper hair growth. You are taking medication for any disease, maybe the intake of medication is the real cause of disturbed hair growth. Thus, tell your doctor about this side effect of the medication. So, there are several causes that are responsible for slow hair growth. We mentioned above that genetic hair loss, among all the causes, is the most considerable health issues because this condition is untreatable. Generally, hair loss experts recommend hair transplant for the genetic hair loss because this surgery is the only preferred solution used by the experts. Therefore, whenever you fell your hair growth rate is low, see a doctor soon to diagnose the exact cause of the problem.